Published February 10, 2016 at 250×250 in Adopt. Hello I am interested in adopting a young dog, we recently moved here to bremerton from Hawaii and wish to add to our family. I have 2 sons one 4yr old and one 9yr old, so we are looking for a small breed dog to keep indoors preferably under 10 lbs since we don’t have a huge backyard. I was wondering how I can go about looking at the dogs in person and the potential next step. My husband, daughter & I live in North Seattle area and are looking to adopt a new member to our family. I am really hoping to meet your Preeda Chen if she is still looking for a new happy home. We have a blended family with one 12 yr dog-Barney, and 3 adult kitties-Sobe’, Inka & M&M. Sadly my 13 yr old Chihuahua passed away last summer, and our 14 yr old Black Lab passed away 2 1/2 years ago. All of our dogs have been with us since they were puppies, and all our kitties came to us as rescued adult cats. My husband works full time and I am home all day every day so she would always be with me. I love to go on long walks every day and would love an active puppy to learn to go with me. I very much look forward to hearing back from you. Hello, my family would like to adopt a dog and are just beginning the process. We lost our 15-year-old lab mix two years ago and now it’s time to bring somebody else into our home. We have two children ages 12 and 15. We live in a house in Ballard and are self employed. We are looking for a young dog without special needs that is not a flight risk. Currently have interest in Eddy Yenchie. Is he available to meet? Hi, I lost my beloved dog a little over a year ago and have always felt like something was missing without having that energy around. My partner and I both grew up with dogs and recently have decided that we’d start looking for a new addition to our little family. We fell in love with Mia instantly, the black Pit Bull puppy, and were wondering if we could fill out an adoption form or come meet her. Looking forward to hearing back from you, thank you! How do I find out about adopting Bergamot. We would love information on Maysuki. I think Bertie from Thailand, with that casual bon vivant air has captured my heart and that of my husband and sweet five-year-old Glen of Imaal Irish terrier at home. I have filled out many applications but will do so for now for Bertie. I would be interested in adopting Bella Pearl. I am very interested in Hottie Tate. That cute face is calling to me to bring her home. I have lots of time, love an cuddles to share with Hottie Tate. Please let me know if she is still available and what the next step is. She sounds perfect and I’d love to meet her. within a retirement community. He is active and will walk with him/her daily. He is looking for a companion dog, that is also good around other dogs. Me and my 15 yr old son want to adopt a dog. What is the process to follow as next steps? Hello. I sent an email inquiring about Romsai, Bertie, and Vok. 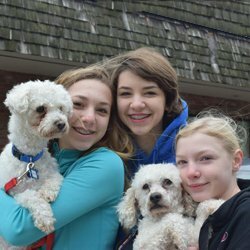 Looking to adopt 2 or more companions! Is Ryan Suzi still looking for a home? Hi, I’m interested in the little Taiwanese mountain dog mixes, Seppo Chan being the favorite, but we also like Sophie, Shaffer, and Becky Chan. We are a household who’s very familiar with dogs. At one point we’ve had 6 dogs. They are very calm and well behaved. Right now we have 3 boys, ages 7, 5, 3, an old husky, and two young cats. We’d like to introduce a young puppy to the household before our old dog passes away. We believe that a young dog would be a good companion for our old dog and having a mentor would be a calming influence on a new puppy. I work part time and have a work at home friend who can watch on days I cannot watch the new puppy. Please send me the info needed to adopt or foster. Thank you! Hello, I was wondering if Teddy Suzi is still available and I wonder if I could meet him. I am interested in adopting Bertie. The 2 year old Cairn Terrier mix. He caught my eye because I would like to adopt a dog that can help me with my depression and anxiety and I heard that Cairn Terriers love to cuddle and I think I would be able to give Bertie lots of love. I live near Uwajimaya and I could adopt it in a few weeks at most. Send me an email and let me know about it. We have had 8 dogs in our life at various times. Our latest dog past away recently and we are lost without having a dog in our lives. She was 13 years old. I would like to see Milo BB if possible. I live in Bellevue. I am interested in adopting Seppo Chan. His adoption fee is a little out of range, so I am hoping you would be willing to work with me. Also I have three dogs… Renya (Beagle mix – 8), Schotzie (JTR mix – 3), And Kanto (Maltese/Schnauzer mix – 1.5). I recently saw Seppo in Renton and would love for him to meet/play with my dogs. Please get back to me. Thank you. Where do I find an adoption application? My boyfriend and I are young professionals who would love to adopt a puppy. We are very interested in Dobby or Puffin from Korea, and would provide a great home with lots of love and care for them. Please let me know if they are still available and how we can go about adopting them! I live in a senior park, so am limited on the size of dog I am allowed to have. My last dog I had for 18 years was a black lab/wolf mix, but he has passed on many years ago. I have always wanted to have a cocker spaniel and am very interested in Lionel from Korea. Please let me know what I would need to do to provide him with a forever home. I’ve waited a long time to get another pet, and for some reason I feel this one calling out to me. Hi I am interested in meeting Emmett if he is still available? How do I make an appointment? Hi I’m currently interested in Sori. I had a St. Bernard when I was small and have a shiba inu back in my home country. Came to US to study and would like to adopt a dog! Hi my name is Matthew and I’m interested in adopting Alfie. Can’t seem to find the application for him. Hello! I am very interested in Wilson. We would love more information about him and potentially meet up with him. 🙂 Thank you! Hi! I would love to meet and get more information on Oliver from Korea! Thanks. Hello, I am very eager to meet Eddy Yenchi and learn more information about him. Thank you! I am interested in adopting bebe, can I get an address and come to see her in person? HI I am interested in adopting Buddy and would like to learn more about the process. Thank you! Hello I would love to know more about Bella Landers and what the process may be for adopting her! I have been looking for a sweet Havanese to adopt and Bella looks like everything I was hoping for and more. adopt and Bella looks like she may be a good fit for our family. Judy Greene Where do we fill out a form? Is Barney still available? Looks like Capri os gone.. I sent an email about the Pomeranian Rosey, but thgoutht I would post here as well. I was wondering if she is still available? Hi. We are interested in meeting Griffon Landers and/or Bentley. Are either of these guys available or be at the event today in Bothell? If not, could we arrange to meet sometime today? We live in Redmond. I can’t find the application on the site. Thanks. I am interested in Orchid and would like to talk to you about her. Thank you. I’m very interested in Tinkerbelle Bono! Please let me know when I can come visit with her. I am intersted in Danika. I was wondering if I could get anymore information about her as well as access to an adoption application? Hi, I am very interested in Blessing. I would love to meet her and foster or adopt her. I live in a big home, fenced yard and have a sweet, older dog who would live a friend. I am interested in meeting Oscar. My husband and I are both retired. We lost our 15 year old beagle about 18 months ago to cancer. We are ready to share our home with another 4-legged friend. I am interested in Sawyer! Am I able to get more information about him as well as the adoption application? I love to adopt Ben from Korea. If He’s still available let me know. Hi, My family is interested in Bebe or Barney from Korea if they’re still available. I’m going off to college and I don’t want to leave my mom home alone everyday so a puppy would be a great fit for her. Hi, I am a young professional looking to adopt a rescue. It’s been two years since I lost my pup and companion, and I am ready to find another companion to add to my life. I have had dogs since I was born and home doesn’t feel like home without one. I’d very much like to meet Bailey from Korea with the intention of adopting him if we’re compatible! I have had a life filled with dogs and look forward to adopting a new fur baby! I currently have 2 extremely happy and well-behaved yorkies! Fenced yard, fully fenced and gated deck and tons of experience with small dogs! I look forward to hearing from you at your earliest possible convenience! Hi, I am interested in meeting Calrina from Thailand if she is still available. Would you be able to send me more information about her? Thanks! Hello, my name is Shreya and I’m interested in adopting Martha from Korea. She seems like a very sweet pup and my family and I are very interested in her. My family and I would love to have her. Hi, I am interested in adopting Teddy Tyler from Korea. Could I get more information about him as well as an adoption application? My 9 year old daughter and I are interested in Lucy from Mexico. I’m interested in Marty Max. Is he still available? We’d like to adopt Lomi or Lady Bono. Please let us know if they are available. I inquired about Martha from Korea a month ago and I haven’t gotten any reply? if you can send me more information about the process of adopting her, I’d really appreciate it.Thank you! Hello, I am interested in adopting Yoda BB. Is he still available? My fiance and I are very interested in Annie (from Korea) and are wondering if she’s still up for adoption. How do we go about meeting the dogs? We’d like to meet Walter (from Korea) and see if he’d be a good fit for our family. Hello! We are interested in meeting Jango. Please let me know if he still needs a forever home! I am deaf and can’t call, please I love Mulan and want to meet Mulan as soon as I can. Can you please please text me? 368-808-0533 text only- thank you. Hello we are interested in adopting Dottie Ray. How can we meet her? I am interested in adopting Walter. I would like to find out his location and if he is available. We are interested in Norman! Please let me know if he is still Available! We would love to meet him! I am very interested in Junior Bell. I just love his sweet little face. I have rescued dogs throughout my life and am ready for my next baby. Please let me know how to proceed. Thank you so much. Hello, I am very interested in Carmela the Shar Pei from Korea and would like to know if she is still available? I have grown up with Shar Pei and currently have a very friendly 4 year old Shar Pei at home. I am extremely knowledgeable with their breed, temperaments and health problems. Thank you very much. I am very interested in adopting Athena, my father just rescued Lottie. I met her today and am ready to get a dog after having to put down my lab last May. I really love this organization and want to help. I just love what you guys are doing so much and I want to give one an amazing spoiled life. I have been thru your web site trying to find the form I fill out to begin the adoption process. I have not found the form. Please give more specific information. ADOPTION just leads to pictures not to forms. Help. Hello, I am Ella and I am interested in adopting Nala. I would love to enter such a cute dog into my life and was wondering how to proceed. HI, im michelle and interested in adopting lucy loo, i live in seattle and been looking for a chihuahua mix, pls contact me!